Hester Monk is running a clinic in a sketchy part of London, treating prostitutes for disease and injury. But one evening, prominent businessman Nolan Baltimore is murdered in this neighborhood. It is presumed that an interaction with a prostitute or pimp went wrong. 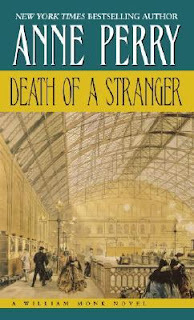 Then a young woman named Katrina Harcus approaches William Monk because she fears that the railway company Baltimore and Sons is involved in a shady deal that could result in unsafe conditions for its passengers. In the course of his investigation, Monk recovers some of his lost memories and they involve time working for this very rail company when a horrible crash occurred and his good friend Arroll Dundas was imprisoned. Is there danger of another train crash? And is that actually why Nolan Baltimore was murdered? As with all of Anne Perry's mysteries, there is far more going on than there seems at first. What actually drew me in was that William would learn more about his past, after an accident that caused severe memory loss back in book one. He has always known that he was sort of a different person before his accident, judging from how people treated him after, so he has a certain paranoia about the sorts of things he could have done. But I also really liked the subplot about Hester's clinic. During the course of this novel they were having issues with their space and knew they might have to move. More importantly, because of the murder there were police everywhere, which meant the prostitutes weren't getting much work. One of my favorite parts of this book was a conversation about this problem between William and Hester, when she complained about the situation and William got a little snarky. "You wish to find who killed Baltimore so the police will leave and the prostitutes can get back into business? You have strange moral convictions, Hester." "If I could change the world so no women ever went into prostitution, I would," she said angrily. "Perhaps you can tell me where I should begin. Get every woman a decent living at something more respectable, perhaps? Or stop every man from wanting - or needing - to buy his pleasures outside his own home? Perhaps every man should be married, and every wife comply with her husband's wishes or better still, no man should *have* wishes he cannot satisfy honorably. That would solve at least half of it. Then all we would have to do is change the economy. After that, changing human nature should be relatively easy." Monks response: "You have rather escalated your demands. I thought all you wanted was for me to solve Nolan Baltimore's murder." This is why I love Hester. She is SO practical. A woman after my own heart. Had I lived in Victorian times, in a mystery novel, surely we would have been besties. As with all the books in this series, it ends with a courtroom drama. Oliver Rathbone (mysteriously autocorrected by my phone, in a note, to "rat hobbies") is defending a young man of the murder using some rather elaborate questioning as he circles around to his point. The judge, who has obviously never read any other books from this series, gets more and more exasperated with Rathbone, asking him a number of times if he's planning to ever get to the point. I have to wonder that this judge isn't familiar with Rathbone, who I think is supposed to be a pretty well-known attorney in London at the time. I think this bit was maybe a bit overdone. However, when it all shook out, I was satisfied with the conclusion. As I mentioned in my kntting post on Sunday, every winter I listen to one of these mysteries while knitting. It's so perfectly cozy. I almost stopped after the last book in this series, but I'm glad I chose to continue.